OS Engines are the world leader in model airplane engines. Many RC engines are described with full specifications. engine produced was a 1.6 cc gasoline model airplane engine, the "Type 1" and 200 were manufactured. It came about as the result of a suggestion by an American buyer, Mr. Paul Houghton and it was exported under the name of "Pixie"
After WW2, production of the now famous "MAX" series of engines was started and soon the whole world of model aircraft engines was aware of OS. Today OS engines is the premier manufacturer of model airplane engines and sets the standard for the rest of the world. It's products have a reputation for first class manufacturing, with long life, high performance and excellent after sales service around the world. The Wankel rotary engine is still in production today and is the only example of a mass produced rotary, in the world. Produced with the cooperation of Graupner, it is a smooth running and powerful RC engine. Here we have the OS FS 60. The world's first production 4-stroke model airplane engine. Many companies are now in the 4-stroke business, but OS were the first! 4-strokes are noted for their quieter and more realistic exhaust noise and low fuel consumption. The first multi- cylinder 4-stroke was the FT 120. 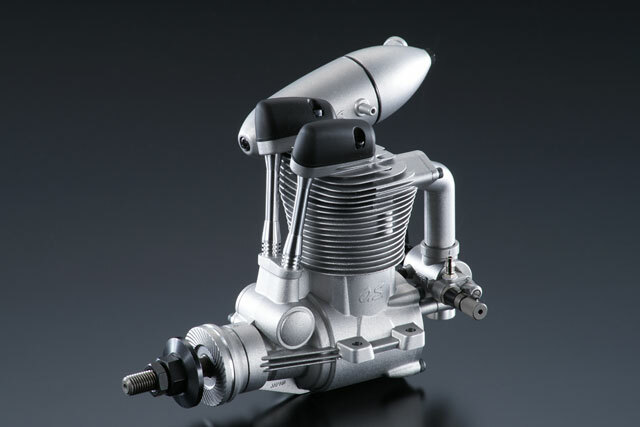 This 20 cc unit was the first OS multi-cylinder and the range has now grown to larger displacement motors and a 5-cylinder radial. These RC airplane engines are ideal for large scale airplanes and are very smooth running. 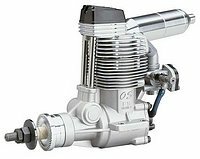 Today OS has an extensive range of model aircraft engines, as well as engines expressly for RC helicopters, cars andboats. All of them are of first class design and construction and the latest technologies are used. OS engines are not the least expensive but they do give a long life and are sure to satisfy the most critical user. Personally I have used many of these engines and still do today! I especially love the 4-strokes and the FT 160 twin and the FS 120S are particular favorites. One tip I will pass on now is that I use the OS F-type plug, in all of my engines, both 2-stroke and 4-stroke. This plug is expensive but very dependable and I just fit and forget about any plug problems! This beautiful looking OS engine is described in full detail, with set-up and running tips, as well as a set of 3-view drawings. Take a look at this super running RC Engine. A great 4-stroke that has many applications in the larger scale and sport airplanes. Visit this page for more details and CAD drawn 3-views. Please note that all the photos, on this page, originate from the OS web site.